March rolls to its conclusion – and what a successful month for Lawrence Tomlinson’s Team LNT. The winter test programme may have been beset by wet weather (what drought? 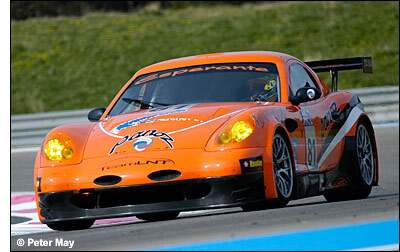 ), but since that superb fifth place first time out with the Esperante at Sebring, the weather for testing has been dry. First stop was at Silverstone (above) on March 22 (just four days after Sebring), for the British GT test and media day, where the team was actually concentrating on shaking down its two Le Mans Series chassis (the Sebring car only landed at Gatwick the day before - it will become the British GT chassis), prior to the next port of call – the Paul Ricard test days (March 25-26). 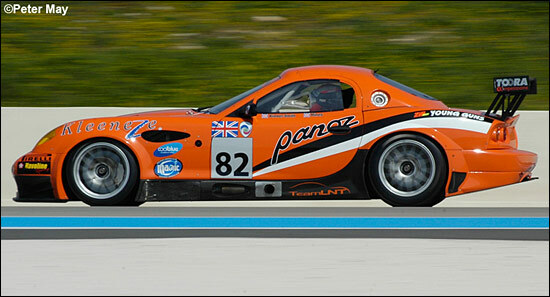 With the double shakedown successfully accomplished, Paul Ricard then served a dual function: testing Pirelli tyres for the LMS, and Avon tyres, in a warm climate, for British GTs. 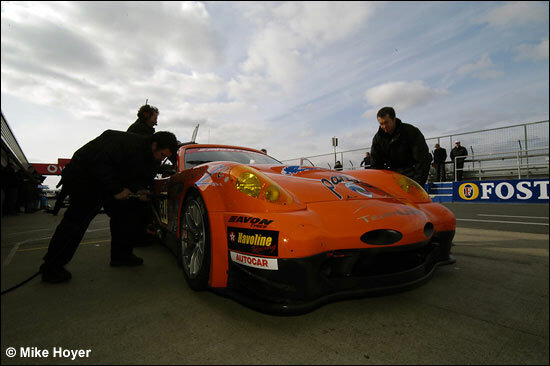 So British GT drivers Tom Kimber-Smith and Luke Hines (the only two driving at Silverstone) made their way to the south of France three days later, to join Richard Dean and Warren Hughes, who were preparing for the Le Mans Series opener at Istanbul – and for Le Mans. Paul Ricard has a long straight, ideal for aerodynamic work. Referring to a previous test at Donington Park, in the dry, Warren Hughes pointed out that “that was the first time we’d revisited a track with these cars – and they were transformed. We’ve got a lovely, controllable oversteer, and we set a 1:06.3 on ‘old’ Pirellis, on a cold day – it was even snowing, although not settling. Our best with the TVRs last year was a 1:08.6. 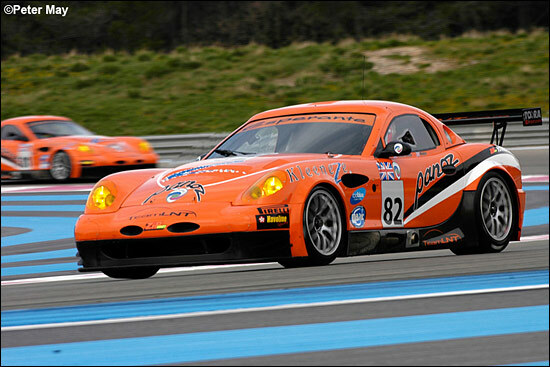 That mood of optimism was reflected in Hughes’ expression as he removed his helmet on the first day of Ricard testing: sweating hard, but beaming from ear to ear, he was delighted with ‘his’ bright orange Esperante. “It’s going really well,” said the just-become father, of Jonathan (8 lb 6 oz., born on March 10). Meanwhile, Luke Hines was getting in plenty of dry weather running – on Pirellis (see below). But here comes the real story of this test in the south of France. Richard Dean again: “We’ve been tremendously impressed with Avon’s service and commitment. Between Wednesday at Silverstone and Monday here, they’ve produced several different constructions and compounds of tyre for us – and transported them here. As a result of that commitment, we’ve achieved in two days what is really a winter test programme. The progress has been amazing. We’ll leave here with something really suitable for British GTs. “Based on yesterday and the changes we made overnight, we’re getting the car to suit the Avon tyres very well. We’ve done a lot of running on Pirellis, particularly at Sebring, but the huge progress has been with the Avons. Slightly oddly, but for a good reason, Richard Dean and Warren Hughes had been doing more of the Avon-running, up to lunchtime on the second day at Paul Ricard. 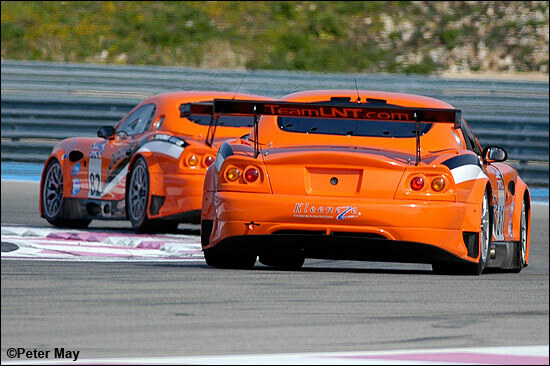 The British GT pair, TK-S and Luke Hines have, of course, the grand total of one GT race between them so far (the win at Sebring, for Tom), so their task was simply to pour on the miles, gaining experience all the time – and the manufacturer of the tyres they were using wasn’t too important. Luke and Tom switched to Avons for the second afternoon, while Warren and Richard switched to Pirellis “ready for Istanbul”. So that was six days – Wednesday to Monday – in the life of Team LNT: from Silverstone to the south of France. And now on to Istanbul. The truck left Paul Ricard on March 28, for the trip to Trieste, to catch the ferry to Turkey. 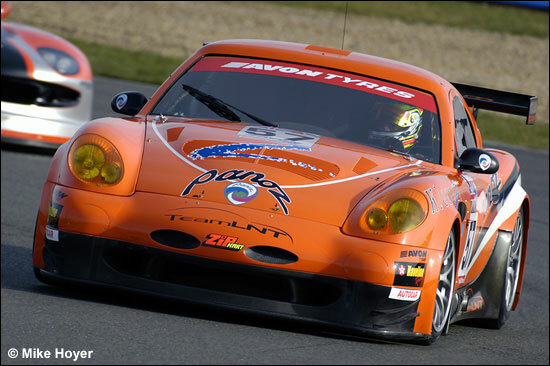 That country hosted the fifth Le Mans Series event of 2005, and rather like the second, third and fourth events (LNT had finished 1-2 at the first, at Spa), it wasn’t a rewarding experience (with the TVRs). But Warren Hughes’ beam was the proof that this time, the team heads to Turkey full of optimism. Lawrence Tomlinson will join ‘Deanie’ and Warren Hughes (and Rob Bell) for that event. Will Lawrence bring his swimming trunks this time? He did last November, but ‘an early bath’ in the race wasn’t followed by a quick dip in the Bosphorus – the weather was far too cold. He and his co-drivers are going to be too busy racing next week to think about a quick dip in the briny. For TK-S and Luke Hines there’s a break now before the British GT Championship gets going at Oulton Park (April 15 and 17). 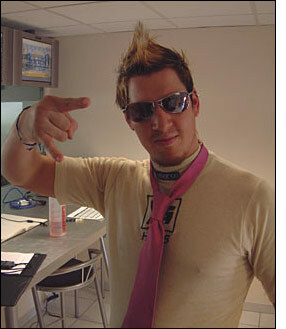 Luke Hines is certainly the bold one of the pair, and he was wearing a bright pink tie at Paul Ricard – with his nomex underwear. What would Bernie have said? TK-S doesn’t mind Luke’s antics at all: while the whole team has warmed to these two, who are going to form a very strong pair in the British GT Championship. Now just as long as the motorhome doesn’t get too warm, Luke…. 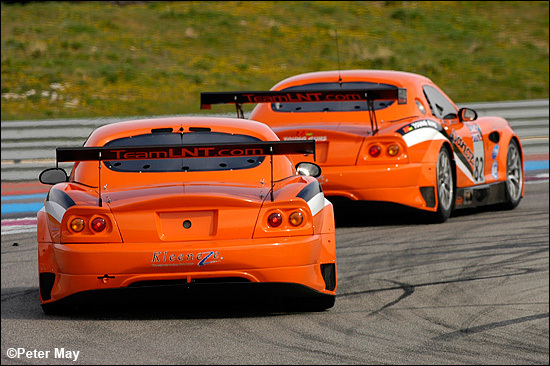 The disappointing news (if it was that) since the Ricard test days is that Team LNT didn’t receive an automatic second entry to the Le Mans 24 Hours. 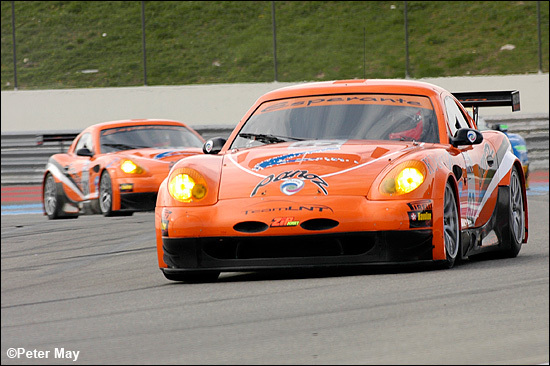 The team’s second car is actually the fourth reserve. Next stop Istanbul – race 2 for Team LNT and its Esperantes (Warren Hughes / Rob Bell, Lawrence Tomlinson / Richard Dean).